2. In large skillet over medium heat, cook bacon 4-5 minutes or until desired crispness. 3. Add onion and sauté 5-6 minutes or until onion is tender. 4. Stir in chicken stock and sage; simmer 1-2 minutes. 5. Add spinach and cook until spinach just wilts. Salt and pepper to taste. 6. 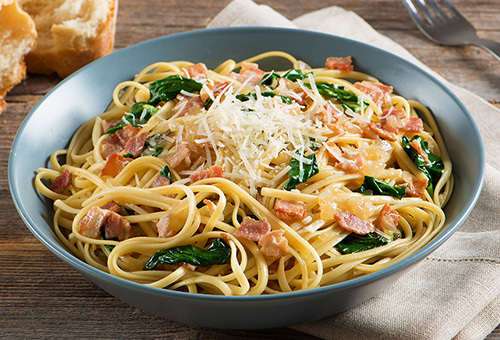 Toss Linguine with sauce and serve sprinkled with Parmesan cheese.